Embrassez les différences et faites la différence ! A two-day seminar to master the inclusive leadership mindset and behaviours to drive inclusion and diversity. The most relevant, practical and up-to-date train the trainer training on inclusive leadership. Facilitated by Thais Compoint, a TOP global specialist in inclusive leadership. First, there’s a crisis of traditional leadership models, as several studies show that the reason #1 for unhappiness at work and for quitting a job is the relationship with supervisors. Second, there’s an increasingly robust literature that show’s that diverse teams led inclusively are more engaged, productive and innovative. For instance, according to BITC, employees of inclusive leaders are 84% more engaged, and according to Deloitte, inclusive organisations are 6 times more likely to innovate. Third, there are major global demographic, cultural and technological trends affecting companies. Inclusive leadership is part of the survival kit of successful leaders as it helps them to navigate such trends. What sets the mastery course apart? A highly interactive, experiential and action-oriented course. Packed with real-life examples and concrete tips. Grounded on the latest business studies and academic research. Designed to give you the clarity, skills, confidence and energy to become a positive change agent, wherever you are. Delivered by a TOP global specialist in inclusive leadership. Thais Compoint an internationally acclaimed specialist in inclusive leadership. Her achievements have been acknowledged with 14 awards, including the prestigious “2018 Top Global Diversity and Inclusion Leader Award”. Thais spoke at 3 TEDx events. She’s a speaker, facilitator, consultant, the author of the book “Succeed as an inclusive leader”, the creator of the Inclusive Leadership Global Conference and of the Inclusiveship Academy, as well as the host of the YouTube show and podcast “The Inclusiveship Show”. Last but not least, Thais is the founder and CEO of Déclic International, a global boutique consultancy that she created after leading the Inclusion and Diversity strategies of three Fortune 500 companies: Vinci, Coca-Cola Enterprises and Cisco. To learn new ideas and proven strategies and tactics for leading teams inclusively. To be able to facilitate inclusive leadership training. To role model inclusive behaviours and to coach others more effectively. Attention: the Inclusiveship Academy Mastery Course focus on leadership behaviours, not on legal requirements, processes, policies or programs. To value and manage more effectively human differences. To attract and engage people of all genders and ages, with different cultures and personalities, among others. To increase engagement, productivity and innovation in teams. To reach business goals more easily, while bringing out the best in people. Assessing and improving your inclusive leadership skills. Articulating powerfully the business case for inclusion and diversity. Communicating, hiring, promoting and developing others in an inclusive way. Resolving effectively diversity related conflict. Building a LGBT+ inclusive culture. Planning and delivering effectively your training program. The Bingham, London Riverside Retreat. One of London’s most unexpected boutique hotels, a Georgian townhouse overlooking the Thames, along the towpath between Richmond Bridge and Petersham Meadows. What’s included in the mastery course? Bonuses worth £ 972 (see below). 100% Money back guarantee – if you’re not happy with the course, simply let’s us know within 30 days following the course and get a full refund. No risk, no worries, no hassle. 6 virtual group coaching sessions over a 6 month period (value £ 750). The online box-set of the 2018 Inclusive Leadership Global Conference, with video recorded interviews of prominent world-class experts (value £197). The signed copy of the book “Succeed as an inclusive leader – Winning leadership habits in a diverse world” (value £25). Access to the Inclusive Leadership Mastery Course Facebook Community. 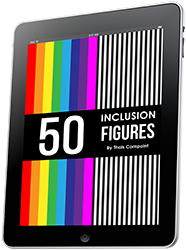 Get your free copy of the eBook "50 Inclusion Figures"
Déclic International est une société qui offre des formations, des conférences et du conseil dans le domaine de la diversité et de l’inclusion. Nous sommes basés au Royaume-Uni et notre champ d’action est mondial.